Praying Girl Chocolate Mold. Approximate Size: 2.75 x 2.5 inches. Also Available in Hard Candy Molds. 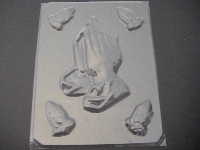 Praying Hands Chocolate Mold. Approximate Size: 6.25 x 4 inches. Praying Boy Chocolate Mold. Approximate Size: 2.75 x 2.5 inches. Also Available in Hard Candy Molds. 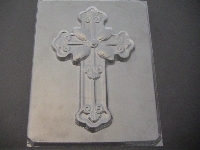 Cross Chocolate Mold. Approximate Size: 8 x 5 inches. Also Available in Hard Candy Molds. Happy Chanukah Chocolate Mold. Approximate Size: 2.5 inches. Also Available in Hard Candy Molds. Religious Assorted Chocolate Mold. Approximate Size: Assorted inches. Jewish Assorted Chocolate Mold. Approximate Size: 2.5 x 2 inches. Also Available in Hard Candy Molds. Star of David Chocolate Mold. Approximate Size: 3.5 x 4 inches. Communion Girl Chocolate Mold. Approximate Size: 3 x 1.5 inches. 90-7006 Jewish Star Bite Size Chocolate Candy Mold LAST ONE! 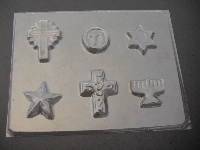 Jewish Star Chocolate Candy Mold. Approximate Size: 2 x 1.75 inches. Not Available Wholesale. 90-7103 Jewish Symbols Chocolate Candy Mold LAST ONE! Jewish Symbols Chocolate Candy Mold. Approximate Size: 2 x 1.25 inches. Not Available Wholesale. Fairy Heart Chocolate Mold. Approximate Size: 2.25 x 2.5 inches. **Will recieve mold shown in picture. C037 Christmas Assorted Chocolate Candy Mold LAST ONE! Christmas Chocolate Mold. Approximate Size: Assorted. Not Available Wholesale. Haman's Pocket Chocolate Mold. Approximate Size: 1.5 x 1.5 inches. Not Available Wholesale.